A user’s profile includes contact information, relationships, locations, skills and certifications, education, and more. Manage user profile information on the Person Details tab. 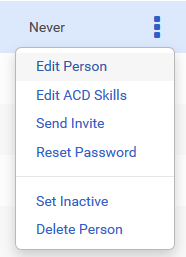 Admin role or the Directory > User > Edit permission assigned to any user role. Click the More Options button and from the menu that appears, click Edit Person. Click the Person Details tab. Edit the user’s profile data.